It was an impromptu ride. I woke up at 5:30am this morning, and after reading the morning papers, I got bored at home and decided to go for a morning ride. As I was aimlessly wandering around Singapore, and idea struck me – Bukit Brown! 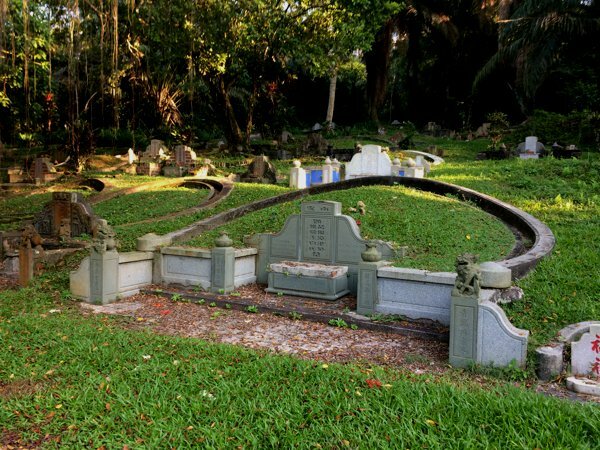 Bukit Brown is a cemetery site that has caused some controversies some years back when the government of Singapore announced plans to build a a road through some part of the grave site, resulting in the necessitating of the destruction and exhumation of some 5,000 graves. Nevertheless, the public debate on the site seem to have simmered. But I’ve never had the opportunity to visit the place. Until today. 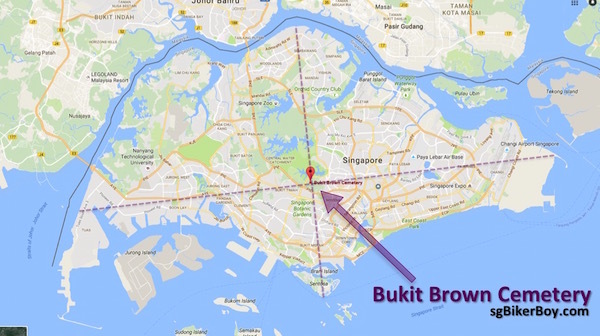 The location of Bukit Brown Cemetery seem to lie at the intersection between the two lines joining the tips of Singapore. 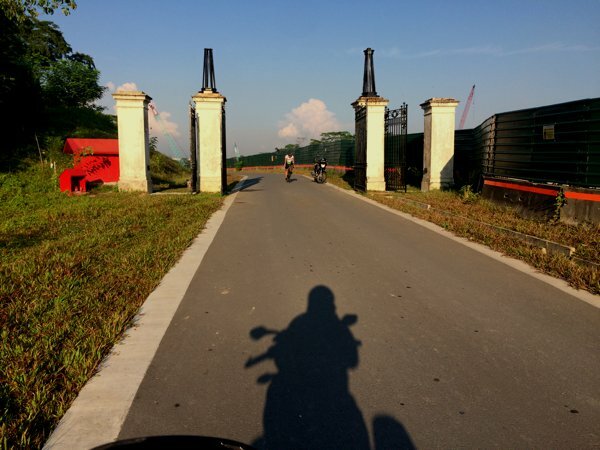 The entrance of Bukit Brown. Actually, this shot was taken from the exit side due to the position of the morning sun. The area around the site is primarily paved, but getting around on a car will be a little challenging as the roads are rather narrow. Motorcycles, bicycles and other small vehicles will find moving around rather easy. Tombs lie up to the edge of the main roads in Bukit Brown. 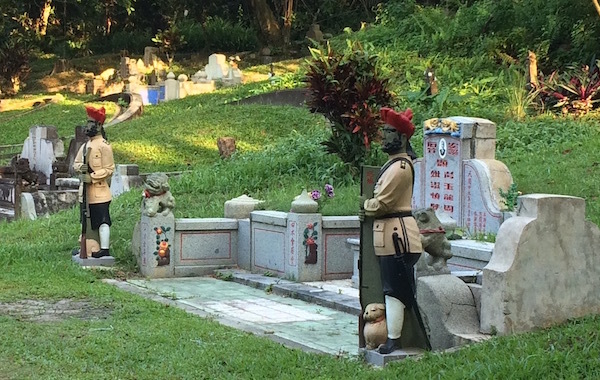 A typical Chinese tomb in Bukit Brown. This is one of the bigger ones. A very well-maintained grave with 2 figurines that look like Gurkhas apparently guarding the resting place of the owner. I assume that whoever rests here must have been pretty wealthy. 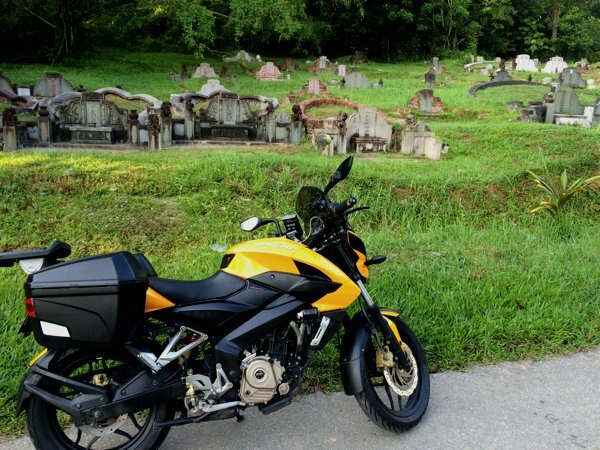 My Pulsar 200NS visit to Bukit Brown. 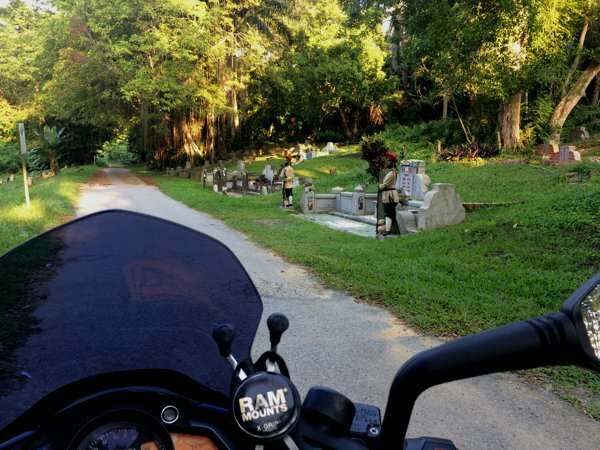 For those who aren’t too spooked out by the idea of riding through a cemetery, Bukit Brown is actually a pretty nice place to head to on a Sunday morning. It’s not as secluded a place, and I saw quite a bit of human traffic there – joggers, cyclists, dog owners walking their pets, and I even saw someone walking his horse there! Oh dear… Hope you’re fully recovered. Previous Previous post: Lithium-Ion batteries in Motorcycles?